The second week of the Australian Open tennis is always interesting. Unfortunately watching it is incompatible with blogging. Tonight Novak Djokovic prevailed 7-6 (7-1), 3-6, 6-4, 4-6, 6-0 over defending champion Stan Wawrinka and will now meet Andy Murray who beat the Czech Tomas Berdych in four sets on Thursday night. Although Wawrinka’s game fell apart in the final set, prior to that he showed that he had the game to mix it with the top players. Berdych, ranked at seven in the world, still looks on the fringe. The old guard looks like running the show for a while longer. By the way Wawrinka and Berdych are both aged 29. I’m tipping Murray for the final. Wawrinka broke Djokovic’s serve five times in all and I suspect he isn’t in prime physical condition. He looked vulnerable. Only a fool would write him off, however. The women have been playing during the day in the quarters and semis, so I haven’t been able to follow them. Earlier I did see something of the young American Madison Keys, who looks one for the future. The coroner was told that gunman Man Haron Monis executed Lindt Cafe manager Tori Johnson after making him kneel on the floor. The killing was witnessed by a police marksman who called the control centre. The police immediately stormed the cafe. Six fragments of a police bullet or bullets, which ricocheted from hard surfaces, hit Katrina Dawson, causing her death. A former member of the Australian military’s elite domestic counter-terrorism unit has publicly suggested that police used the wrong rifles during the siege, with heavy bullets posing a high ricochet risk in the enclosed space. Mitchell McAlister, writing in the American online journal SOFREP, a magazine presenting news and analysis from former special forces operatives, said he believed the choice of the M4A1 carbine may have contributed to the death of Ms Dawson. ALP support rose to 56.5% (up 2%) on Australia Day weekend, well ahead of the L-NP 43.5% (down 2%) on a two-party preferred basis. If a Federal Election were held now the ALP would win easily according to this week’s Morgan Poll on voting intention conducted with an Australia-wide cross-section of 2,057 Australian electors aged 18+. Primary support for the ALP rose to 39.5% (up 1%) now ahead of the L-NP 37.5% (down 1%). Support for the other parties shows The Greens at 12% (up 2.5%), Palmer United Party (PUP) 3% (up 1%) while Independents/ Others were down 3.5% to 8%. Support for PUP is highest in Clive Palmer’s home State of Queensland (7%) – which faces a State Election this weekend and Western Australia (4%) with negligible support for PUP in other States. 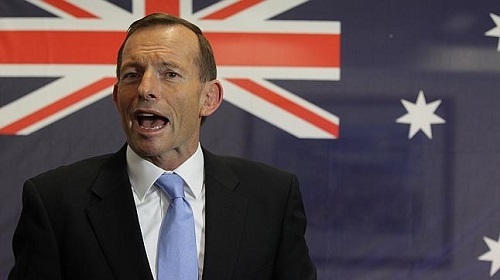 Some pundits are suggesting the Abbott has six months to turn things around. That makes the 2015 budget rather crucial. The only demographic preferring the LNP is now the 65+ group. (Reuters) – Greek leftist leader Alexis Tsipras promised on Sunday that five years of austerity, “humiliation and suffering” imposed by international creditors were over after his Syriza party swept to victory in a snap election on Sunday. With about 60 percent of votes counted, Syriza was set to win 149 seats in the 300 seat parliament, with 36.1 percent of the vote, around eight points ahead of the conservative New Democracy party of Prime Minister Antonis Samaras. Syriza’s victory has electrified the left in Europe – even moderate social democrats who have floundered in search of ideas and inspiration since the 2008 crisis. Now there is talk everywhere of “doing a Syriza” – and in Spain, where the leftist party Podemos is scoring 25% in the polls, more than talk. I heard Tsipras say he wants discussion about Greece’s debts, not negotiations. The market’s have not taken fright, so I guess the sky won’t fall in. It is said that David Cameron’s hopes of achieving a “full-on” re-writing of the EU’s governing treaties have suffered a severe blow. On Australia Day we went to see the film Birdman, which I am informed was one of the better films of 2014. Here’s a reviewer that liked it. The plot is unprepossessing – a washed up actor is directing and starring in a play, which in preview looks like one disaster after another. It’s rivetting, funny and serious, with layers of meaning, beautifully acted and shot. Given the violence from time to time, it can’t end altogether well, but to tell would be a spoiler. Highly recommended. For the best, go here. The Essential survey was conducted online over three weeks from January 9 to 26 and was based on a sample of 566 Queensland respondents aged over 18 years. Newman has now rushed back to Brisbane from North Queensland to prop up his own seat. On the 7.30 Report the other night, we were told that more was being spent in Ashgrove than in the five neighbouring electorates combined. Greg Jericho takes a look at the cost of austerity economics in Queensland. Employment growth is almost non-existent and mostly part-time. Oddly, Queensland is the only state where construction is the largest industry sector. Only 9% of the economy is attributable to mining compared with 30% in WA. Meanwhile Graham Readfearn has taken a look at the major parties’ attitude to climate change. One of Newman Government’s first moves was to scrap the state’s Office of Climate Change. Labor has announced no plans to re-instate it. I direct council to amend its draft planning scheme to remove any assumption about a theoretical projected sea level rise due to climate change from all an any provision of the scheme, including strategic framework, zones and precincts, overlay assessment tables, codes and policies. Later in the letter, Seeney wrote that any mandatory elements of the council’s planning scheme “must reflect only proven historical data”. The Newman Government’s attitude to climate change was either ignore it or legislate against it. It appears Labor has just ignored it. Bill Shorten thought it was a hoax. Some of Abbott’s Cabinet colleagues did too. Editorials of newspapers across the country have slammed Prime Minister Tony Abbott’s decision to hand Prince Philip a Knighthood, labelling the move “ludicrous” and “flabbergasting”. Rupert Murdoch tweeted that it was “a joke and embarrassment”. The broadsheet’s editors said knighting Phil was a “decision lacking leadership”, “high-handed” and “tone-deaf”, saying that another captain’s pick like this “might be mutiny”. “It’s a decision that reeks of an outsider cocking a snook rather than a prime minister seeking to unite a nation,” the editors said. The can and slam party did not end there. The newspaper also said the knighthood for Prince Philip was “fair dinkum ridiculous” and “out of touch”. “Mr Abbott must decide whether he wants to be a monarchist, first and foremost, or the Prime Minister of Australia,” it finished. It’s hard to believe Credlin would have supported such nonsense, but Murdoch may be blaming her for his at times lone wolf style. The only support I’ve heard for the knighthood decision has been from Kevin Andrews and that royalist fella David Flint. Jim Middleton suggested that Abbott’s stupidity could cost the LNP in the Queensland election. I would have dismissed that as nonsense, but the ABC Vote Compass found that 19% of Queensland voters said they would be very affected by federal matters and a further 29% said somewhat. At the very least it has further tarnished the brand. The irony is that Abbott had just spent a week phoning backbenchers to show them he is listening. 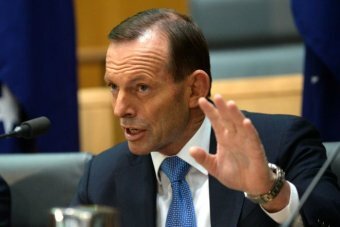 In truth Abbott may now be on a last chance to keep his job. An OECD survey revealed that many Australian schools have Year 11 and 12 students who lack basic necessities, including housing and adequate nutrition, according to an AAP report last year in The Guardian. Australia has almost as many schools with significant numbers of Year 11 and 12 students from disadvantaged backgrounds as Mexico. An OECD study has found that many Australian schools have Year 11 and Year 12 students who lack basic necessities such as adequate housing, nutrition and medical care. 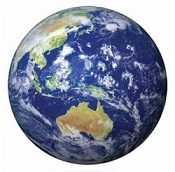 The latest OECD Teaching and Learning International Study – the world’s largest international survey on teaching and learning – says 66% of Australian upper secondary teachers work in schools where principals report that more than 10% of the students come from so-called “socio-economically disadvantaged homes”. The figure puts Australia above Poland with 62%, almost on par with Mexico where the figure is 70%, and well above the average of 43% among countries surveyed. In Norway, the figure is just 16%. “It is important to ensure that teachers in these schools are well equipped so that they can provide students with effective learning environments despite these potentially more challenging school environments that can be linked to having large numbers of students from socio-economically disadvantaged homes,” the report found. 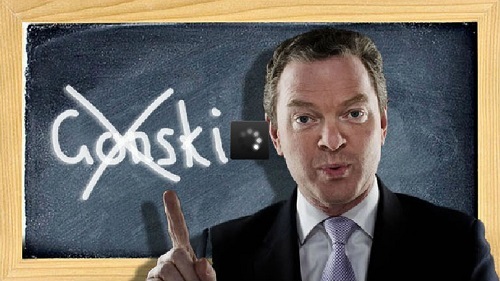 After the 2013 election Christopher Pyne made it clear that he didn’t support the Gonski funding model and the principles of equity that underlie it. He and Abbott misled voters on this score before the election. He promised to have a new funding model in operation by 2015. I’ve lost contact with the progress of this matter, but can’t imagine that adequate resources are flowing to areas of need. Reading Julia Gillard’s book makes one realise how much she and Wayne Swan bent the system to squeeze out extra funding for schools while some $160 billion was found in budget savings across six budgets. That kind of commitment doesn’t exist in the LNP, probably not any longer in Labor either. We should be concerned, however, that we live in a society where such levels of inequity exist. Wayne Swan in his book claims that inequality decreased in Australia on his watch. The data cited above stems from the end of his time. There is no prospect of improvement under Abbott. I understand that out private school sector is the largest in the world. Part of our problem may be that we consolidate disadvantage in the public school sector. The AAP/Guardian report was based on the analysis of data about upper secondary schooling from the 2013 OECD Teaching and Learning International Study (TALIS), published in December. Earlier a report relating to lower secondary schooling had been published, including a series of Country Notes, mainly about teachers and teaching. In Australia teachers appear to be well qualified, with high job satisfaction, but the feeling of being under-appreciated. They seem to spend their day in much the same way as teachers elsewhere. My impression is that the get more professional development than the average, but it seems to be less effective. 41% of lower secondary teachers were men in Australia compared with 32% in TALIS countries. 61% of our principals are men compared within TALIS. Apparently we have the lowest proportion of women in the role of principal amongst the countries surveyed. Australia, the land of the not so fair go! 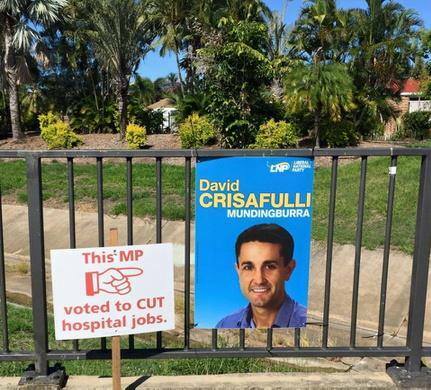 In Queensland politics we expect the bizarre as normal. Antony Green in a sober and comprehensive review of the Queensland election, tells us that there is nothing in the constitution that says ministers must be members of parliament. 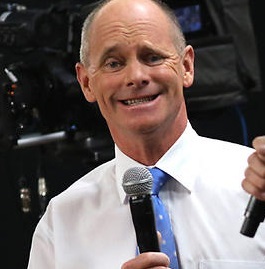 So Campbell Newman, who would lose his seat on a 5.7% swing, could theoretically retain the premiership if the LNP nevertheless won. Convention says otherwise, and I think we can count that possibility out. He could, however, retain the premiership for three months on a Commonwealth precedent while a safe seat is found. I doubt that will happen either. The powers that be in the LNP don’t love him enough, there would be a shortage of volunteers to give up their seat, and I don’t think the electors would be impressed. Green thinks a Labor victory, requiring a 12% uniform swing, is a bridge too far. There have been some individual seat polls with swings in that order, but I think the last statewide poll was Morgan which had the LNP on 50.5 TPP. It’s still close, and I think, quite clearly, the LNP is scared. Scared enough to allege that the ALP is being funded by criminals and bikies. Palaszczuk fired a “put up or shut up” demand back at Newman, whose response is that it must be true because wherever he goes people tell him it’s true. Apparently it is so open that all these LNP acolytes in the community can see it happening. 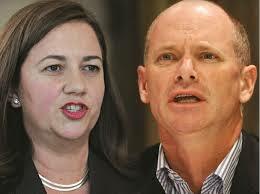 For Newman scuttlebutt is evidence and the onus is on Palaszczuk to prove it’s not. A sign of the LNP’s twisted logic. Meanwhile, bikies made a donation to the LNP, which was of course refunded. ‘Facts’ have been problematic in this campaign. Labor says health workers have been sacked, the LNP claims they have employed more. I understand that both are true. Initially there were sackings, including frontline staff. Then federal money became available, courtesy of Gillard/Swan, which enabled hiring. This money won’t continue under Abbott/Hockey. Queensland real unemployment is now 12.7% (up 1.8% since October-November 2014) and under-employment is 10.3% (up 1%). This means total Queensland unemployment & under-employment is 23% (up 2.8%). (Interviewed November & December 2014). That’s heading in the wrong direction and is worse by a considerable margin than any state except Tasmania. Newman says the election is about the economy and jobs, Palaszczuk says it’s about asset sales, and the economy and jobs. The astonishing magic pork barrel continues, something like $8.6 billion worth of it. Newman was heard to say that if electors voted the wrong way their electorate wouldn’t get any. It sounded like a threat. Newman said overseas buyers would be welcome. Clive Palmer said, yes, the Chinese are sure to buy the lot, sending a shiver down many a spine. Ernst and Young brought out a report saying electricity would cost less under privatisation. Quiggin says this is essentially nonsense: prices in states with privatisation are roughly the same, and prices in all states have rocketed since ‘market reforms’ to introduce competition were instituted in the 1990s. Newman has refused say why the LNP will not commit to the four principles of “accountability and good governance” outlined in an open letter from 50 prominent Australians, earning the ire of corruption fighter Tony Fitzgerald, QC, who helped draft the letter. Mark has a neat roundup at The Monthly, saying, inter alia that KAP and PUP are not preferencing the LNP. The fragile flame of hope still flickers. Only four days to go, and the town here seems still on holiday! Firstly, he sells OUR assets. Then he puts this money in HIS Great Big Pork Barrel. Then he uses the money from HIS Great Big Pork Barrel to buy OUR votes. 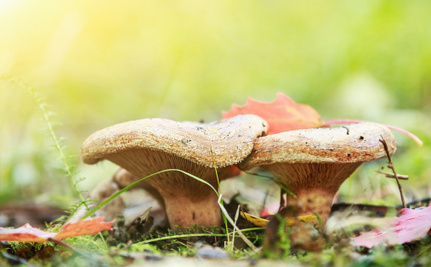 Biodegradable packaging has been made from mushrooms for use as foam, insulation and the like. The article doesn’t say whether it is cost competitive. A new study finds that wheat yields drop on average by 6% for every degree Celsius rise in temperature. Global production of wheat was 701 million tonnes in 2012, but most of this is consumed locally. Global trade is much smaller, at 147 tonnes in 2013. The loss of production per degree equates to 42 million tonnes, with obvious implications for shortages and prices. Year-to-year variability is likely to increase. An obvious strategy is to develop and use heat tolerant varieties. My understanding is that there has been a reduced research capacity generally in agriculture across the world. Worldwide, solar energy has continued to grow even when economies were shrinking. By 2013, almost 138.9 gigawatts (GW) of photovoltaic (PV) had been installed globally, states the European Photovoltaic Industry Association in the report Global Market Outlook for Photovoltaics 2014-2018. From the bottom, blue is Europe, brown is Asia Pacific, purple is the Americas and orange is China. Europe added almost 11 GW, second only to wind. In the US alone, there are now about 174,000 jobs linked to solar energy, with 36,000 new jobs expected by the end of this year. India’s plans to build a solar PV modules manufacturing plant over the next three years worth US$4 billion and 20,000 new jobs. Giles Parkinson tells how the costs of solar will fall a further 40% in the next two years, reaching grid parity in 80% of global markets. The International Renewable Energy Agency (IRENA) met in Abu Dhabi last weekend, ahead of the World Energy Future Conference in the same venue. Australia thumbed its nose by sending an embassy staffer rather than a minister, as a country genuinely interested in renewables would have done. Australia is increasingly being seen as a “no-hoper” and an “outlier” in terms of large scale renewable energy. No-one seems to have told Donald Sadoway, a professor from the Massachusetts Institute of Technology, who is seeking to strike up research partnerships with Australian universities and secure funding of $50 million for a pilot manufacturing plant of the liquid flow batteries. Sadoway thinks Australia would provide a strong home market, ideal for remoter population centres difficult to serve with a high quality grid. The LMBs [liquid metal batteries] are being hailed as a potentially low cost option for utility-scale battery storage. That is because the nature of the technology means that they can cycle – or discharge – thousands of times without having its capacity reduced. The batteries could last for 300 years. No doubt the minister for industry will quietly tell him that we don’t do large scale renewables, or manufacturing, in Australia. The best scientists in the world are all telling us that our activities are changing the climate, and if we do not act forcefully, we’ll continue to see rising oceans, longer, hotter heat waves, dangerous droughts and floods, and massive disruptions that can trigger greater migration, conflict, and hunger around the globe. 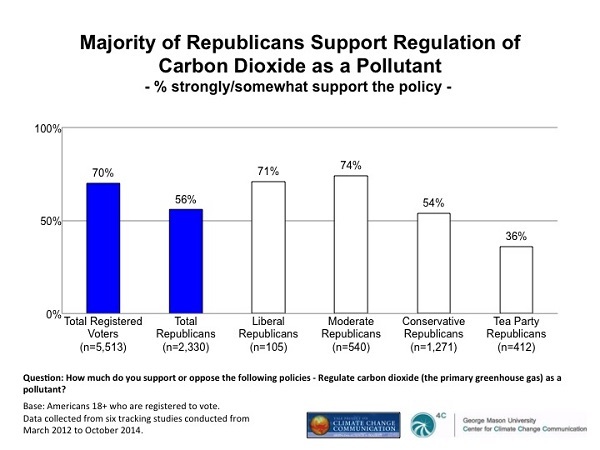 Meanwhile the Republican-controlled US Senate has voted 98-1 to say the climate change is real and not a hoax. However, that doesn’t mean that humans are the cause. After all the Bible tells of climate change and it’s just arrogance to think humans are the cause! At least Mitt Romney thinks humans are the cause and thinks (again) that we should do something to stop it. How arrogant is that?! 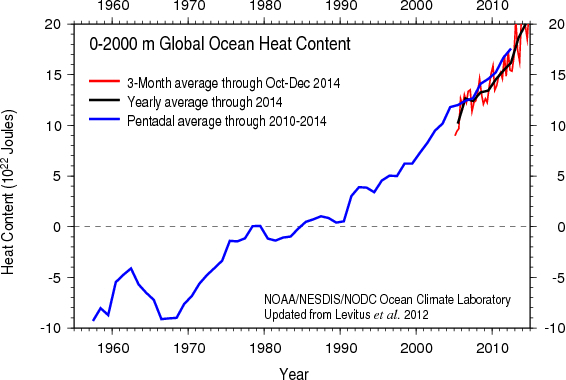 2014 heat referred to surface temperature. Since about 93% of additional heat resulting from global warming ends up in the oceans, they give a better indication of changes in the Earth’s energy system. John Abraham at The Guardian links to a thorough review of ocean heat measurement methods. In a writ filed in the Victorian Supreme Court, 43-year-old MacGill claims the sports body failed to pay him injury payments after his retirement from Test cricket in May 2008. MacGill’s lawyers say the cricketer suffered multiple injuries during his career, including broken bones and had ongoing problems as a result. MacGill claims numbness in his hands, swelling and pain in a knee as well as shoulder pain ended his Test career. I’ve always been interested in time. The past doesn’t exist. It’s done with, except as remembered and represented in the present. 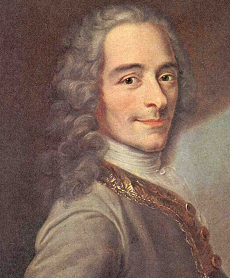 The future only exists as a possibility, contained in the present. But then which nanosecond of the passing kaleidoscope is ‘now’? It turns out to be a package, created by the brain, about 2.5 (2-3) seconds long. You might call it, the experienced moment. According to Laura Spinney in the New Scientist (paywalled) the brain reacts in terms of milliseconds but organises what it sees in meaningful packages. If you take a movie of say a baton change in running and shuffle the images within a 2-3 second envelope your brain corrects them, rearranges them and smooths the movement out according to contextual meaning. You don’t notice the jumble, you ‘see’ a smooth baton change. The contextual meaning is taken from what is held in short term memory up to 30 seconds. So we all fudge it a bit at times – see what we want to see. Our sense of self is an abstraction made up of a series of snapshots of imperfect self-observation. John Quiggin does some mental gymnastics on life expectancy in response to Joe Hockey’s brain fart concern about living to 150 and the affordability of Medicare. The short story is that we are living longer, but not as much as the stats would superficially indicate. The average life expectancy at birth has improved in part because we are better at surviving the first five years. Life expectancy is 80/84 (for men and women respectively) today. In 1910 it was 55/59. The improvement is 25 years. But in 1910 at age 65 you could expect to live to 76/78. Now that has become 84/87, an improvement of only 8-9 years. Hockey worries too much! Quiggin says the bigger worry underemployment of prime-age workers. Speaking of underemployment, sociologist Immanuel Wallerstein reckons that, in a world of pain, the best indicator to measure the well-being of the world-economy and the well-being of the vast majority of the world population is employment rates. Unemployment, he says, has been abnormally high for some years and has steadily crept upwards over the last 30-40 years. The reality is, he says, that we are living amidst a wildly oscillating world-system, and this is very painful. The world system is gradually self-destructing. Certainly inequality is increasing according to a new Oxfam study. By next year the richest 1% will own more stuff than the other 99%. The charity’s research, published on Monday, shows that the share of the world’s wealth owned by the best-off 1% has increased from 44% in 2009 to 48% in 2014, while the least well-off 80% currently own just 5.5%. Remember that the U.N. Convention on the Law of the Sea regulates ownership of the Arctic, allowing for exclusive economic zones stretching 200 miles from land and even further if undersea resources sit on a continental shelf. The claims beyond this limit are becoming increasingly relevant, as the ice thins and clears in the summer. Soviet-era bases in the Arctic are being reactivated. A third of the Russian navy is based there. Going into 2015, it is estimated that the Russian armed forces have around 56 military aircraft and 122 helicopters in the Arctic region. Russian Defense Minister Sergei Shoigu stated that 14 military airfields on Russia’s Arctic seaboard would be operational by the end of the year. The Ministry of Defense also said some of the 50 modernized MiG-31BM Foxhound interceptors expected by 2019 will be charged with defense duties over the Arctic. Defense spending was the only sector escaping budget cuts. In fact it increased by 20%. Russia’s interest is in part economic. The region is said to host 30% of the world’s undiscovered oil and 13% of its gas. 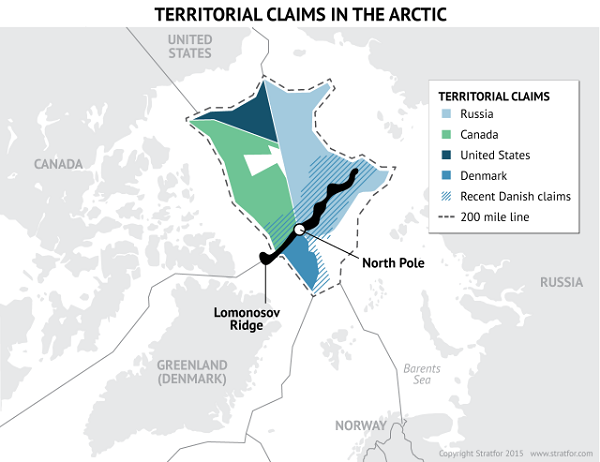 On the political side, of the eight countries in the Arctic Council, five are members of NATO, fuelling Russia’s suspicion that opposing forces are massing against it. The federal Government’s forays into health policy show no signs of becoming realistic. The 2014 budget foreshadowed that the Commonwealth might get out of the funding of hospitals in favour of the states accepting a higher and broader GST. The problem here, as Gillard pointed out in her book, is that health expenditure expands faster than the GST revenue. Then we had $7 co-payments for GP visits in an effort to keep poor people out of doctors’ surgeries. This was followed by the fiasco of proposing and dumping the $20 cut to the rebate for short GP visits. According to recent news reports, the plan was originally opposed by Joe Hockey and then health minister Peter Dutton. 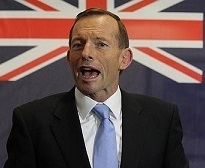 Abbott insisted and then unaccountably backflipped. Now Joe Hockey reckons we are living too long. Some kid just born somewhere is bound to live to 150. 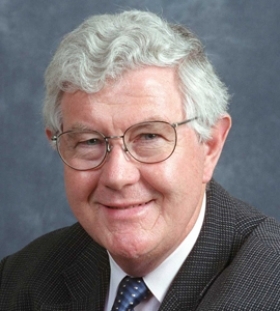 John Dwyer, Emeritus Professor of Medicine at the University of NSW, has long been an advocate for preventative health care. He says in a paywalled article in the AFR that many hospital admissions (costing $5000 each) could be prevented by primary care intervention in the three weeks prior to admission. Medicare expenditure of $19 billion each year is dwarfed by hospital expenditure of $60 billion. There is now an abundance of evidence that a focus on prevention in a personalised health system improves outcomes while slashing costs. Some systems have reduced hospital admissions by 42 percent over the last decade. The Brits have just been presented with a review that concluded that an extra $132 million (in our money equivalent) spent on improving primary care would save the system $3.5 billion by 2020. Worth a look, I would think! There is another problem in the works. Only 13% of young doctors express any interest in becoming a GP. The discrepancy in income potential for GPs when compared to that of other specialists is now huge. Young doctors looking at the professional life of our GPs are uncomfortable with the current “fee-for-service” model that encourages turnstile medicine that is so professionally unfulfilling. Many GPs join corporate primary care providers preferring a salary. New Zealand has facilitated 85% of GPs away from fee-for-service payments. The same is true in the US for 65% of primary care physicians. Finally, says Dwyer, we could take the $5 billion cost of the private health insurance rebate and spend it on all of the above. Once again we are embarrassed by the incompetence of our politicians. 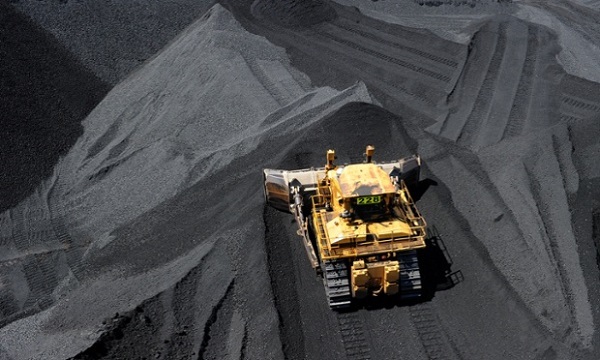 A new legal challenge to the proposed Carmichael coal mine – Australia’s largest – will test in the federal court whether climate change caused by greenhouse gas emissions should be taken into account when assessing prospective coal licences in Australia. The challenge, by the New South Wales Environmental Defenders Office on behalf of the Mackay Conservation Group, will argue that federal environment minister Greg Hunt failed to take into account the climate impact of greenhouse gases emitted by the burning of coal from the Carmichael mine when assessing whether to grant its licence. It cites the impact of global warming on the Great Barrier reef, an area of world and national heritage, as a relevant consideration which the minister should have been taken into account. The linked article cites some of the legal precedents, which show that this case is far from vexatious or frivolous. Outgoing deputy Labor leader, Tim Mulherin, said coal remained “an important and vital energy source for Queensland and the rest of the world”. Thermal coal from nine proposed projects in the Galilee, when burned in export markets such as China and India, would produce an estimated 705m tonnes of CO2, more than Australia’s total greenhouse gas emissions of 542m tonnes a year. However, Labor in not going to spend hundreds of millions of dollars on building the railway line to the coast. Back in 2009 a team lead by Johan Rockstrom of the Stockholm Resilience Centre identified nine planetary boundaries we should not cross if we are to avoid undermining the biophysical systems upon which our species depends. These nine boundaries are climate change, ocean acidification, stratospheric ozone depletion, alteration of nitrogen and phosphorus cycling, freshwater consumption, land use change, biodiversity loss, aerosol and chemical pollution. A new paper led by Will Steffen of the ANU and the Stockholm Resilience Centre argues that climate change along with “biodiversity integrity” should be recognised as core elements of the Earth system. We are in trouble with both. The world as we know it developed during the Holocene from which we are rapidly departing. We need urgently to get atmospheric concentrations of CO2 back to 350 ppm. Background extinction rates without human impacts are thought to be about ten a year per million species. Current extinction rates are anywhere between 100 to 1000 times higher than that. Australia’s Catholics are preparing to step up campaigns to address climate change ahead of an expected call to action by Pope Francis. The Global Catholic Climate Movement, an international coalition of Catholic groups including Catholic Earthcare Australia, was launched on Thursday to bolster support for a global climate treaty at the Paris summit planned for December. If you drew parallel trend lines from about 1970 it would be full bore ahead with 1998 a slight outlier. 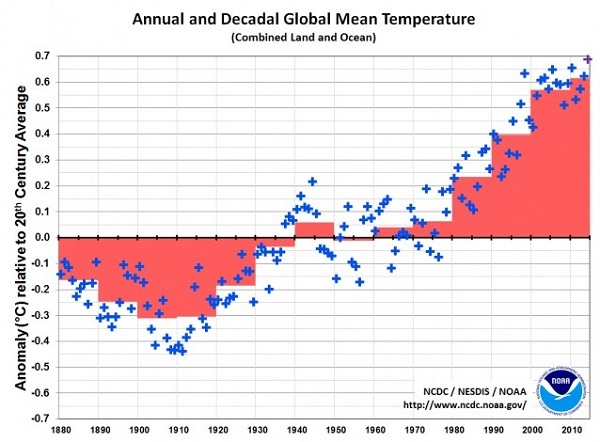 At Climate Central we are told that 13 of hottest 15 years on record have all occurred since 2000. The odds of that happening randomly without the boost of global warming are 1 in 27 million. There’s been some excitement about a new study of sea level rise. The difficulty in establishing long term trends is that prior to the satellite era (1979, I think) it has been very difficult to establish what happened. Data is globally patchy and incomplete. Tide gauge measurements suffer because the wind blows the water around, and the land that it is referenced to might be rising or sinking. The clearest account of the new research by Carling Hay and others I’ve found is at Carbon Brief. Hay et al found sea levels from 1900 to 1990 to be 1.2 mm pa on average, lower than the 1.5 previously thought. This makes current sea level rise some two and a half times faster, with the implication that ice sheets a contributing more than previously thought. Ultimately, it is not clear down to what level of accuracy we will ever know the sea level evolution over the past hundred years or so. But for practical purposes, I don’t think it matters whether the rise from 1900 AD has been 3 centimetres more or less. I do not think this changes our outlook for future sea-level rise in any significant way. But if I understand him correctly, he would already have been considerably concerned about the decay of ice sheets and how that process could accelerate. However, he strikes me as wanting to be super careful not to run ahead of the data, which is entirely commendable. One comment was that this research could add a metre to prospective sea level rise this century. I think Rahmstorf is suggesting that is premature. The first is a direct cut of $5 to the Medicare rebate for everyone except pensioners and health care card holders. The ALP, Greens, and some crossbenchers have indicated they disagree with this so it may never happen as it must pass the Senate. The second is to freeze the rebate until 2018 which means that because of inflation, this will amount to a $3 cut to the rebate for everyone by 2018. This can’t be stopped as it doesn’t require parliamentary approval. Only the third of these has been abandoned. There are two points to be made about this. First, the Government’s aims have not changed. They want the poor to go to the doctor less to ‘save’ Medicare, or as Woodruff suggests to institute a two-tiered medical system. The Federal Government wants a two-tiered health system where credit cards decide what level of care one receives. This is the American way. The next proposal may be to replace our flag with the Stars and Stripes. Secondly, the politics is just awful. As Norman Abjorensen points out, new minister Sussan Ley was sent out to dump proposals that Abbott had robustly defended not 24 hours earlier. Was Abbott rolled? What does Julie Bishop think? Why did they get themselves into this mess in the first place? Clearly they didn’t sound out the senate cross bench. Tim Woodruff is currently the vice-president of the Doctors Reform Society and a specialist physician working in private rheumatology practice in Melbourne.